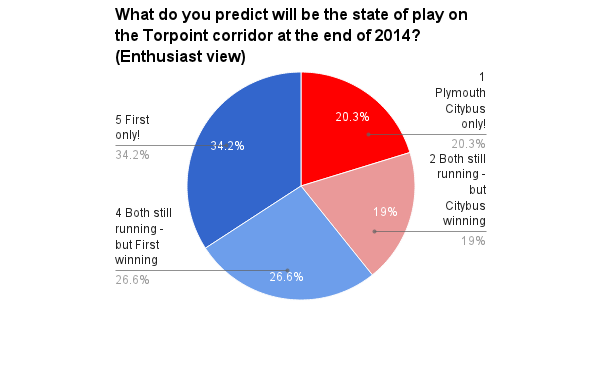 Plymothian Transit: A ‘Point too far for Citybus? A ‘Point too far for Citybus? As you can see this is a much stronger call in favour of First. Almost a third belive that Plymouth Citybus will call it a day leaving things to First. Almost two thirds see First winning on this corridor. The enthusiasts among you see it stronger in favour of First although even the transport professionals call it for First (just). I reckon Citybus will continue the 32 despite at present very low customer numbers. 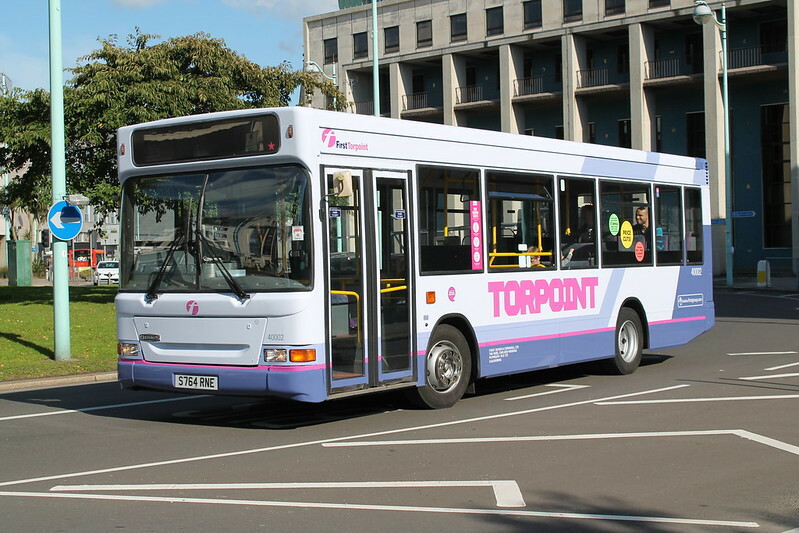 This is a disaster for Citybus, no one wants them in Torpoint, only customers 32 picks up is in Stoke/Devonport etc, Citybus if sensible will pull out of Torpoint but knowing them they will continue as they do not want to loose face! Plymouth city bus will need to catch up as First may use branding or fares to compete with them giving First the edge! Despite the superior buses of PCT the better headway always seems to win as passengers will always get on what comes first, vehicle not company. If First manage to rebuild their presence in Plymouth then Citybus will probably concede on this one but then they can afford to. They can always come back on the route if First is looking vulnerable. 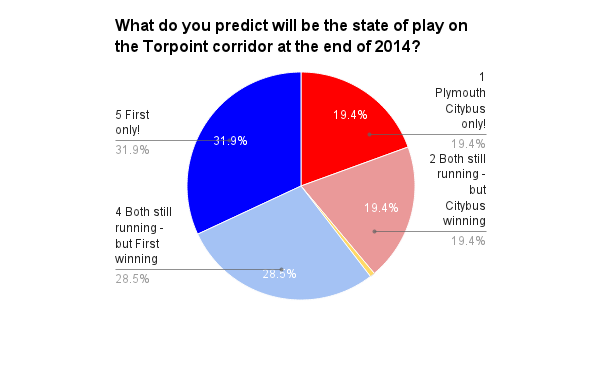 The next couple of questions asked in the survey were more open – what routes do you expect Citybus / First to introduce in 2014. We will look at the answers you gave shortly! Public Transport Experience: a hesitant admission that there were problems (of a minor nature?) with the publicity machine, but under the then proposed "Partnership", everything would blossom into beautiful efficiency and all hiccups would be stifled. Focus Transport: Transport Malta CEO James Piscopo has said he is not completely ruling out the possibility of a nationalised public transport service, but the government's preferred option remains that of a privatised bus service. Transport Illustrated: With a line running just under a mile the Corris is realistically only a half day visit at present but the volunteers really do put on a good show for the visitors with shed visits and a friendly talk on the line's abundant history. Public Transport Experience: Before we return to the minutes of the Travel South YorkshireCommittee for Output of Cartographic Knowledge and Updates for Passengers, fbb will offer a little background. This is Cornwall: BUS FARES due to rise by around 35 per cent last weekend have been altered following pressure from a Cornwall councillor. Norwich Buses: konectbus have confirmed the acquisition of five VDL DB250LF Pulsar Gemini's. Transport Designed: Nottingham City Transport has begun rolling out its fleet of Enviro400-bodied Scania N230UDs, the first of their type for the company. Public Transport Experience: The next leaflet page is headed "Stopping Points for Service 81; an unusual title in that the page does not show stopping points for service 81. I don't think we will see any of these in Plymouth as First will rightly use them in profitable areas. We should however see some newer stock cascaded down and in turn Plymouth's older stock transferred west to Cornwall, I should imagine. 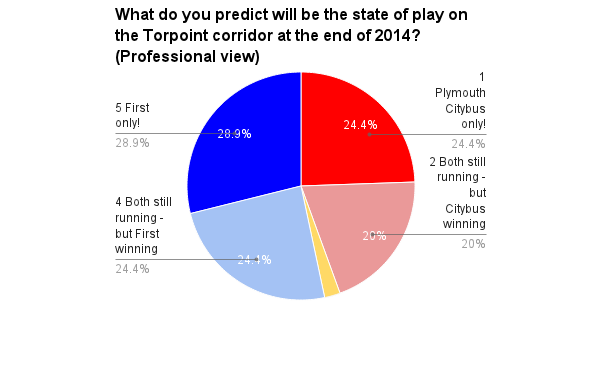 Not all true, as a citybus driver and a service 32. we are picking quite a lot up from Torpoint now.